Here at Tips for Savings we are all about finding ways to save money and help the environment. We have been so lucky to hear about and try new BrytonPick Floss. Go ahead and forget about that old stringy floss in a box that you have to wrap around your fingers. BrytonPick Floss is easy to use, portable, and reusable! First I love the thought of discreet and convenient floss, especially when we are out to eat, over at friends or family, or just out and about. The BrytonPick Floss can be used anywhere and is completely safe to use. The BrytonPick Floss helps protect against tooth decay and gum inflammation. Removes food debris, plaque and stimulates gums to help prevent gingivitis. It is flexible enough to adapt to your tooth shape. And they come in different colors! 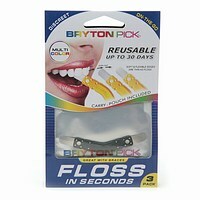 Check out their website and watch the video on how to use BrytonPick Floss!